Built for island hopping, Sanlorenzo's new SX88 yacht line pairs the modern comforts of a penthouse with an adverturous spirit. As we sailed along the Italian Riviera, more than a few gasps were elicited at the sight of picturesque coastal towns in the distance. We were heading towards the historic port of Porto Venere, basking in the sun on board a Sanlorenzo yacht. The sleek vessel glided gracefully towards our destination, to the background score of a barely noticeable hum of its engines and the soft lapping of the waves. We were in Italy at the start of summer to tour the shipyards of Sanlorenzo, the luxury yacht maker that is headquartered in La Spezia, a port city in Liguria, that is also home to the chief Italian naval station. Founded in 1958, the leading luxury shipbuilder served primarily the local Mediterranean market before being acquired by Perotti in 2004. Today, Sanlorenzo is among the top three biggest yacht building firms in the world with three shipyards in Ameglia, Viareggio and La Spezia, as well as plans for a fourth in San Marco. In Asia, it also partners with Simpson Marine as it sees the region as a growing market. Since acquiring Sanlorenzo, Perotti has set out to modernise and expand the company beyond its Mediterranean shores, combining the shipbuilder’s traditional craftsmanship with contemporary design. In 2006, he began to look into going beyond the conventional style of yachting interiors, to bring the comforts of a home into their vessels. He started with convincing Dordoni, whom Perotti recalled with a chuckle, was persuaded with some difficulty before he agreed to collaborate. “But after we did, Citterio followed, then Lissoni”. This intention to create a home at sea shapes the design of the SX88, the first of the company’s next generation of yachts. Recently launched at the Cannes Yachting Festival in September, this “crossover” 27m long motorboat is built for versatility. Its interiors were designed by Lissoni, who worked closely with yacht designer Lou Codega to unite the ambience with its elegant exterior. “Our SX line starts with the idea of using the boat to feel closer to the sea, to enjoy the sea,” explained Perotti. Built for island-hopping, the SX line pairs modern comforts with the adventurous spirit of Sanlorenzo’s Explorer line of yachts, which are larger vessels used for long cruises. Inspired by the loft-style design of penthouses, the yacht’s open-plan layout creates myriad possibilities for recreational spaces on its main deck, as well as a platform for a small sailing boat or seaplane, with a hidden hydraulic platform to move these vehicles with ease. 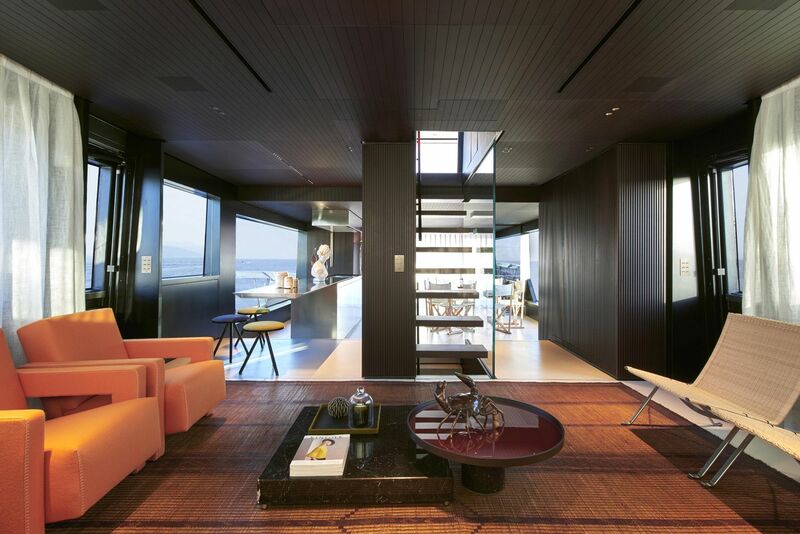 Lissoni envisioned the yacht as a modernist pavilion, with large floor-to-ceiling windows open up to splendorous vistas of the sea, with up to four guest cabins housed on the lower deck next to the master cabin; the latter can also be positioned on the main deck. In lieu of built-in furnishings moulded around the architecture of the yacht, Lissoni opted for loose furniture to recreate the comforts of a stylish home while at sea. He selected iconic pieces from leading made-in-Italy brands including B&B Italia, Cassina, Flos, and Kartell, as well as furniture that he had designed. Looking at his work, Lissoni sees it as the culmination of “imagining and executing visually arresting spaces that are a pleasure to live and play in”. Perotti concurred: “Boating is a way of bringing the family together, to spend time with them, and an opportunity to be close to nature.” It is a belief that the SX88 embodies, with its contemporary design and adventurous spirit. Closer to home, Sanlorenzo will soon be participating in the Kata Yachts Superyacht Rendezvous in Phuket from 8-10 December, 2017. The invite-only event will take boat owners and guests to the Phuket King's Cup Regatta, followed by a blitz of yacht-hopping opportunities on board sleek vessels such as the yachts by Sanlorenzo. This story was adapted from Singapore Tatler October 2017.